Do you know why the fudge fish in Phish Food are smiling? It's because they, along with the ingredients of some other VIFs (Very Important Flavors), are excited about their mission: to not only taste delicious, but to help change the world. Ben & Jerry's is founded on and dedicated to a sustainable corporate concept of linked prosperity. Visit our website to learn more! Enjoy our super premium ice cream, shakes, smoothies and euphoric concoctions at one of our 230+ scoop shop locations. 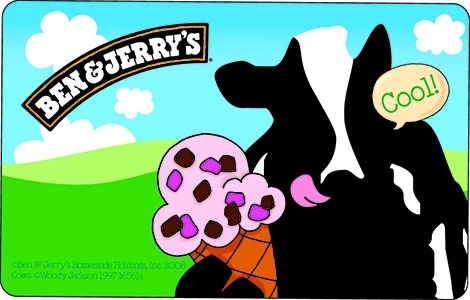 Ben & Jerry's gift cards can be used for food, beverage or gift ware purchases. National Gift Card is the perfect company to assist you with your Ben and Jerry’s gift card solutions needs. We offer many options for you gift card program including customized cards, bulk fulfillment, direct-to-recipient fulfillment, and more. Contact us today to find out how to add Ben and Jerry’s gift cards or call us at 888-472-8747 today. This cool reloadable Ben & Jerry's gift card is issued by Ben & Jerry's Gift Cards, LLC; it does not expire and there are never any fees. It is not redeemable for cash or credit, and lost or stolen cards will not be replaced, except where required b law. The available balance may be used for purchases at participating Ben & Jerry's Scoop Shops in the United States.